Screen printing is very cost effective when you have higher runs (50-1000 pieces) and a 1-4 color design but it can get very expensive when you have low runs and lots of colors. Every color in your design requires a separate screen and each one of these screens needs to be prepared, burned, lined up and properly registered so that all colors in your design line up and print perfectly. One of our graphic designers will need to prepare the separation of your artwork as well which is basically creating a different file for each color in your design so that it can be printed out on a special sheet that is used to burn the image into the screen. In a lot of cases the setup time takes much longer than the actual printing process. 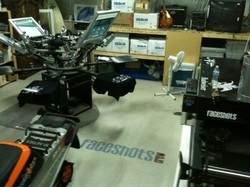 When you see a screen setup fee on your next screen printing job this would be the reason why. Once everything is properly registered and ready to start printing most manual presses (shown in picture) can print about 100 single color shirts per hour with automatic presses printing at a much higher rate. During the printing process there will usually be two people operating a press at one time. On a manual press the first person would be loading the shirts on the printing pallets while the second person would be doing the printing itself. The first person would then unload the shirts as they came around and feed them through the dryer. On an automatic press you would once again have two people but one person would load shirts and the second would unload shirts while the press is doing all the printing. Automatic presses are much better for 4 color process printing as the pressures are always the same so there wouldn't be any variation from shirt to shirt.